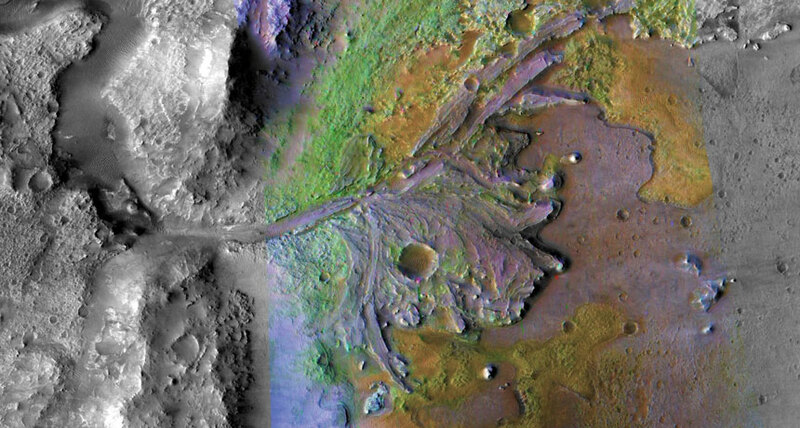 The next NASA Mars rover will hunt for signs of ancient life in what used to be a river delta, the agency announced on November 19. The rover is expected to launch in July 2020 and to land on Mars around February 18, 2021. It will seek out signs of past life in the sediments and sands of Jezero crater, which was once home to a 250-meter-deep lake and a river delta that flowed into the lake. "This is a major attraction from our point of view for a habitable environment," said Mars 2020 project scientist Ken Farley of Caltech in a news conference discussing the site. "A delta is extremely good at preserving biosignatures." Any evidence of life that may once have existed in the lake water, or even evidence that came from the river's headwaters and flowed downstream, could be preserved in the rocks that are there today. The 2020 rover's design is similar to that of the Curiosity rover, which has been exploring a different ancient crater lake, Gale crater, since 2012 (SN: 5/2/15, p. 24). But where Curiosity has an onboard chemistry lab for studying the rocks and minerals in its crater, Mars 2020 will have a specialized backpack for sample storage. A future mission will pick up the cached samples and return them to Earth for more detailed study, possibly sometime in the 2030s. "The samples will come back to the best labs - not the best labs we have today, but the best labs we will have then," said science mission directorate administrator Thomas Zurbuchen of NASA headquarters in Washington, D.C.
Mars 2020 will also use a souped-up version of Curiosity's landing system called Sky Crane, in which a hovering platform lowers the rover onto the ground with a cable. Mars 2020's version will include a navigation system that will help it avoid hazards on the ground, like cliff faces and boulders. Jezero crater is within striking distance of another site on scientists' wish list. That region, called Midway, is just 28 kilometers away from Jezero and contains some of the most ancient rocks on Mars. At the final landing site selection workshop in October, scientists floated the idea of visiting both sites in one mission, a feat seen as ambitious but achievable. But a decision on that will have to wait until after the rover is safely on Mars, Farley said.